Our R.A.C.E.R. is a grassroots program designed to help up-and-coming riders. Qualified riders are allowed to purchase special team bikes and team uniforms at special discounts. Racers compete during the year at ABA and NBL events. Riders can win prizes and merchandise coupons based on their performance. Check out the Free Agent R.A.C.E.R. Team Members in action. Please download Individual or Team R.A.C.E.R. forms and fill out information completely before sending to Free Agent. The Free Agent R.A.C.E.R. Program is for U.S. Residents ONLY. If you have any questions, please e-mail the Free Agent Team Manager. 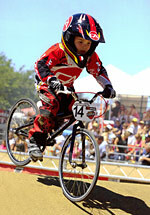 © 2012 Free Agent BMX / All Rights Reserved.